The Ambassador Bridge which spans the Detroit River between Windsor City in Ontario, Canada and Detroit, Michigan in the USA, towers above the variety of sculptures displayed in Odette Sculpture Park on the Canadian side. The bright yellow sculpture in this picture is named the "Composition with Five Elements" and is a scale model which visualizes and tests shapes entitled Cromlech, created by Haydn Davies. The sculpture is made of aluminum, painted in bright yellow and stands 8 feet high. This sculpture is one of many throughout the park, all which have been created by world renowned artists. Picture of a sculpture in Odette Sculpture Park in Windsor, Ontario and the Ambassador Bridge towering above it. The Ambassador Bridge, also built in bright colors, is a privately owned suspension bridge which was completed in 1929. The length of the bridge joining the US and Canada spans 7,500 feet and is the busiest international trade border crossing found throughout North America. 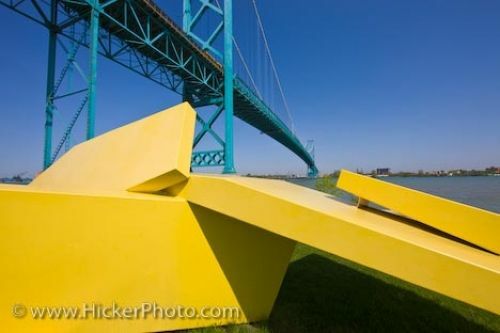 Sculpture in Odette Park (Windsor) and the Ambassador Bridge spanning the Detroit River between the cities of Windsor, Ontario, Canada and Detroit, Michigan, USA.